A veteran Chinese Trotskyist describes his time in the Chinese Communist Party, between joining in 1925 and being expelled in 1929. Edward Ellis on Salman Rushdie's "Satanic Verses"
Sean Matgamna on Austen Morgan's "James Connolly"
Stan Crooke on Ernest Mandel's "Beyond Perestroika"
Belinda Weaver on P J O'Rourke's "Holidays in Hell" and Joe Bob Briggs's "Joe Bob goes to the drive-in"
Obituary of a man who, as editor of the Irish Democrat from 1918 to 1948, and writer of many books, influenced Irish left-wingers in the run-up to the 1968-9 crisis possibly more than any other. A critique of the theories of the Scottish Socialist Party of 1989. (The 1989 SSP was not organisationally related to the later SSP, founded in 1998 and still active in 2010, but its attitudes on the supposed revolutionary significance of Scottish independence were similar). Obituary of the famous writer and one-time Trotskyist C L R James, who died on 31 May 1989. 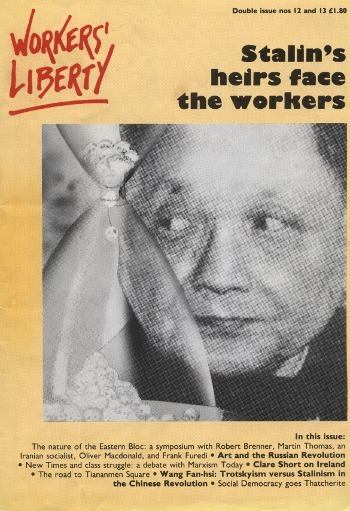 Click here to download the pdf including all these short articles from Workers' Liberty 12-13, August 1989. Strikes in Stalinist and ex-Stalinist states; Rushdie; EU; Dock Labour scheme scrapped; more on USSR strikes; strikes in UK; abortion rights in USA; world economy; British economy; Scottish left and Assembly; independent union in China. The fate of China was shaped by a battle between Trotskyist and Stalinist politics in the Chinese Communist Party in the 1920s. Before 1989 the Chinese workers' movement had been crushed for 60 years. But in the 1920's it fought heroic battles, rich in lessons for today. Elizabeth Millward describes how a working class developed in China, how its struggles interlaced with those of the nationalist bourgeoisie, and why it was defeated.